Noni is a bush found in tropical regions. it has been used traditionally by Polynesians to alleviate many health complaints and to improve general health condition. Adults – Take 1-3 tablets daily, or as professionally recommended. Store below 25º C in a cool dry place. No artificial flavorings, preservatives, sugar, salt added. No artificial colourings with capsules except capsule shell. Noni is a small evergreen tree, which bears a fleshy, yellow fruit. The fruit is ground to a fine pulp, frozen, freeze-dried and encapsulated. 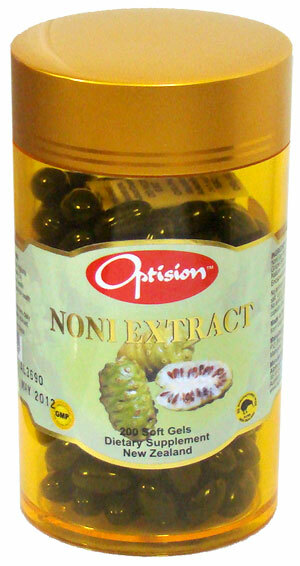 Noni fruit contains vitamin C, enzymes and other beneficial substances. Noni fruit has a long history of traditional use in South Pacific island societies as a versatile folk remedy. The native Polynesians have also used the fruit, leaves and juice of the morinda citrifolia plant as favorite health tonics and skin care aids. To this day, Polynesians consider the plant to be very beneficial in preserving healthy bodies. Noni juice has been called "The feel good Tonic" by many Polynesians. Thousands of people use noni products every day and are convinced of their benefits. Because of Noni Juice has foul smell and unpleasant flavor; people choose to take the capsules form instead. Many scientific studies have been and are being conducted to determine the efficacy of the product and several have shown positive results.